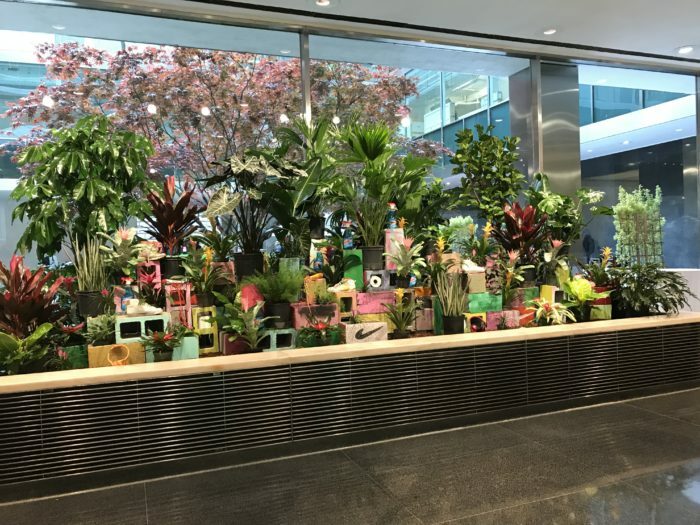 Installation view, Katherine Bernhardt: Concrete Jungle at The Lever House. 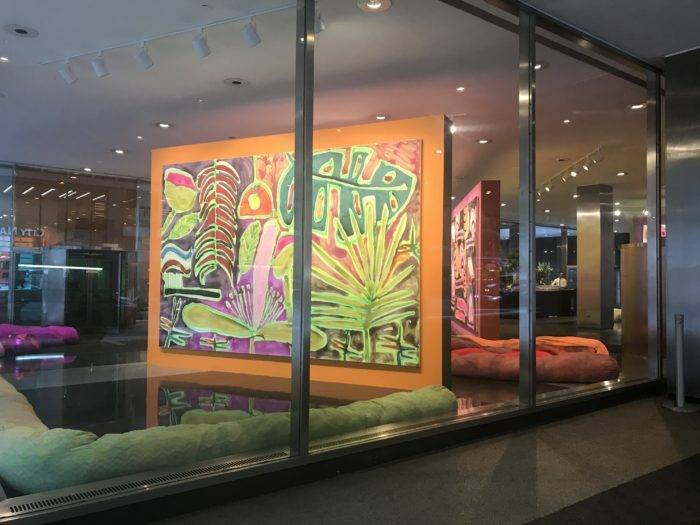 The Lever House Art Collection, which has held impressive installations in their spacious lobby over the last couple years, recently opened a new installation by Brooklyn-based painter Katherine Bernhardt. Concrete Jungle Jungle Love, a site-specific installation, is one of Bernhardt’s most exciting projects to date. 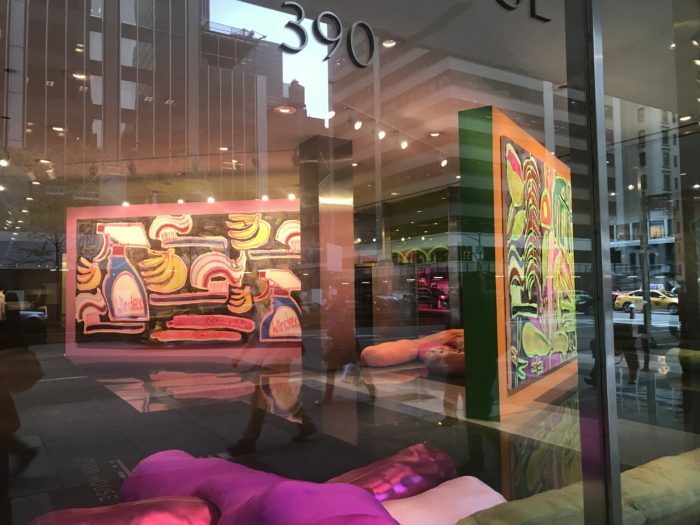 While we’ve witnessed in the last two years Bernhardt’s canvases growing larger and larger and her venturing into murals, this is the first-time Bernhardt exhibits three-dimensional works along with her paintings. 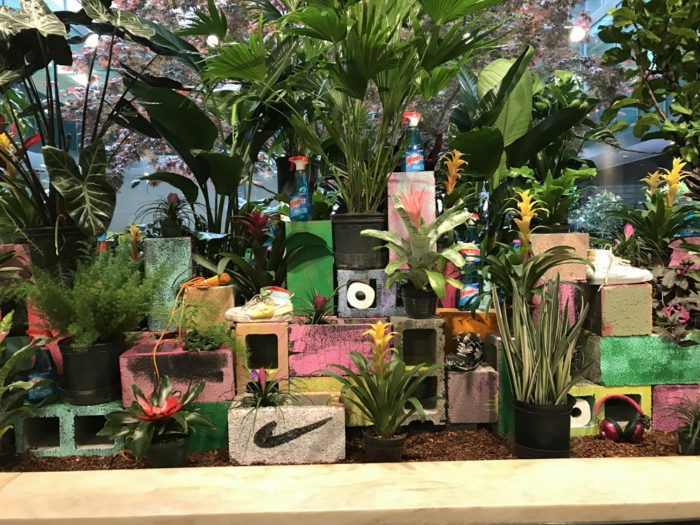 In addition to the nine vibrant painted works, Bernhardt created a number of interactive soft sculptures and a jungle-like plant, sneaker, and concrete block installation. 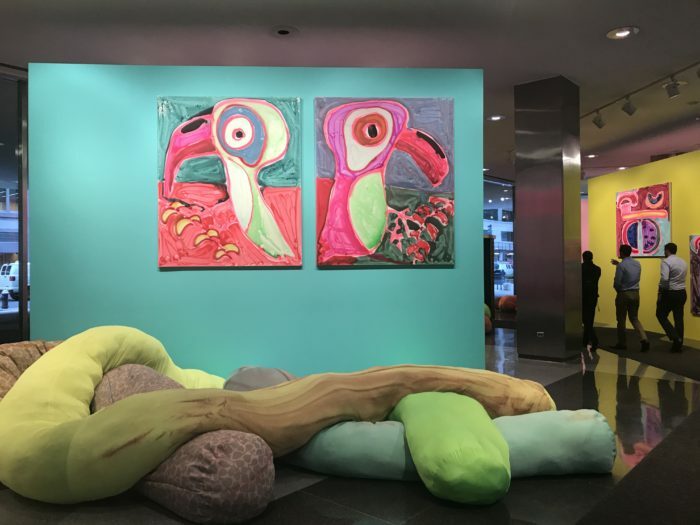 Whether it’s the viewer’s eyes exploring the vibrant colors and shapes of Katherine’s works, relaxing on the soft worm sculptures, or investigating Bernhardt’s decadent sneaker and plant manifestation, the installation in its entirety calls for adventure! 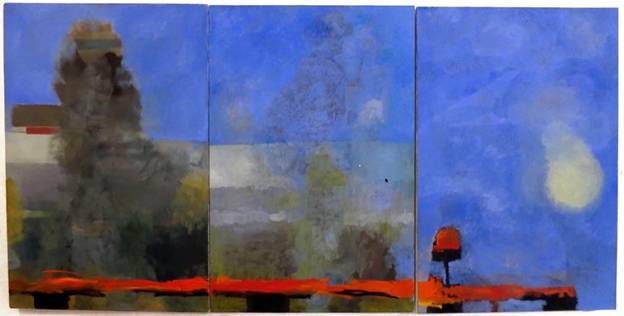 All of Katherine’s paintings pulsate with liveliness and humor. One wishes they were on a tropical island with toucans and fresh papaya and is simultaneously reminded to brush their teeth after. Bernhardt’s play on everyday objects, patterned beautifully on each canvas, has grown with each series of the work. 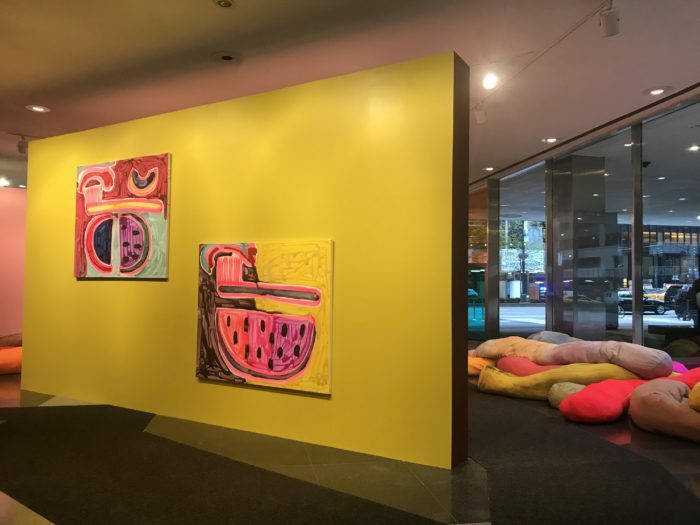 The two giant works in the show, Giant Jungle Office and Jungle Kartell are especially captivating. Bernhardt reminds us of the beauty of these everyday objects- we admire the blue of Windex, the curvature of bananas, and the fragility of a leaf. The soft sculptures are equally as playful, and visitors (especially young ones) are encouraged to climb, explore, and nap on them. 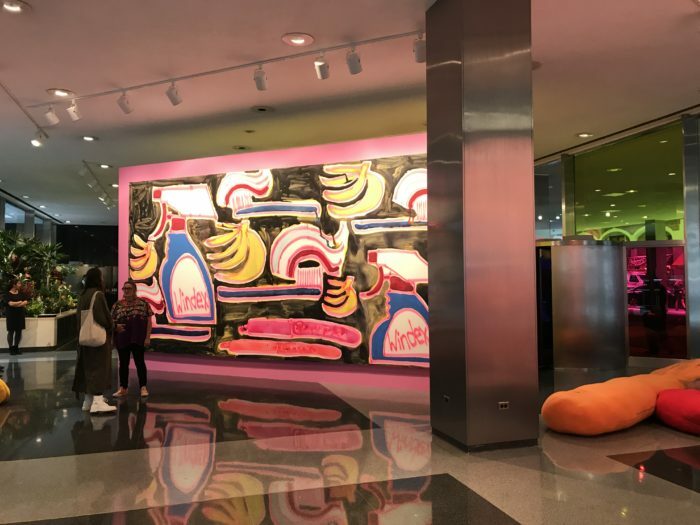 In the press release, Bernhardt calls them giant gummies, but points out that they can also be seen as giant paint strokes that have fallen out of her canvases. 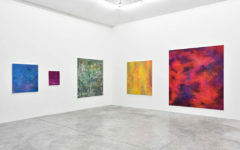 I loved the idea of giant paint strokes, piled on the floors like fallen soldiers. The sneaker, plant, and block installation also feels like it’s been dragged out of one of her works. Or rather, it feels like the wild environment that houses the objects Bernhardt paints. Bernhardt herself has called the installation a “giant fishbowl tank”, where giant paintings, giant Jurassic objects, and giant soft sculpture all coexist. 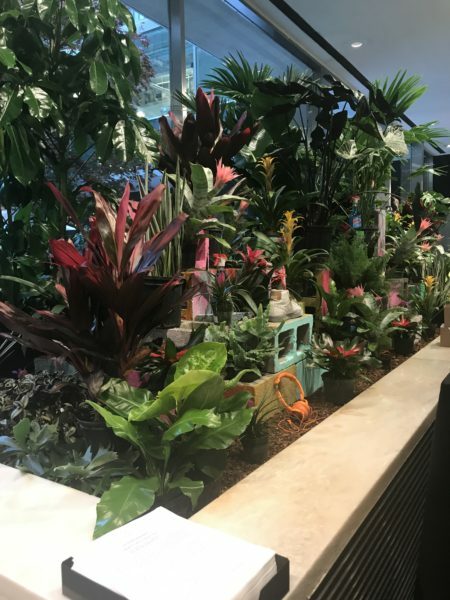 This analogy works super well with the large windows encapsulating the space, as Bernhardt’s installation becomes a tropical greenhouse haven amidst its dreary midtown surroundings. Bernhardt’s work prompts the busy business men and women to slow their step and take in a moment of vivacious playfulness. To put it simply, Bernhardt’s installation gives the area much needed life. Concrete Jungle Jungle Love will be up until 28th of September, 2017. The Lever House Art Collection is located at 390 Park Avenue, New York, NY 10022. 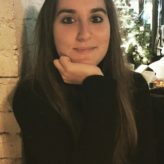 Gracie Brahimy, who has been working in the arts since graduating Sarah Lawrence College in 2013, is currently the artist assistant to painter Katherine Bernhardt and has worked at both CANADA and Susan Inglett Gallery in the past. She is also purusing a masters degree at NYU in art history and has been granted a research fellowship in Florence in the fall of 2017.